A university has shown the first photographs taken by a £100 telescope built from parts made by a 3D printer. The University of Sheffield researchers behind the project claim the image quality from the PiKon telescope compares to models costing 10 times as much. Plans are available online allowing anyone to download and print the components needed to build the device. The telescope's images were unveiled as part of a science festival in the city. 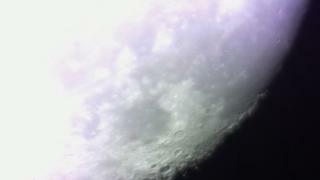 It captured numerous pictures of the moon's surface during its first use. One of the Pikon's developers, physicist Mark Wrigley, said he hoped the new telescope would be a "game changer". "We hope that one day this will be seen on a par with the famous Dobsonian 'pavement' telescopes, which allowed hobbyists to see into the night skies for the first time," he said. "This is all about democratising technology, making it cheap and readily available to the general public." At the heart of the telescope is the camera module of a Raspberry Pi, the cheap, barebones, British built computer. Based on Isaac Newton's reflecting telescope design, a concave mirror focuses an image directly onto the Pi camera sensor, which is mounted onto components created by 3D printing. Other parts such as the lens and the mirror can be bought from online suppliers. Because of the small size of the Raspberry Pi camera, it is possible to mount it directly in front of the mirror. The PiKon telescope has a magnification of times 160, which means that on a cloudless night it will allow detailed views of the moon's surface, as well as galaxies, star clusters and some planets. Mr Wrigley said that the designers would use public feedback to improve the telescope and develop new products. Other events in the university's Festival of the Mind, include a live musical performance by 150 musicians of Gustav Holst's symphony The Planets in a pop-up planetarium and an interactive video game art gallery.